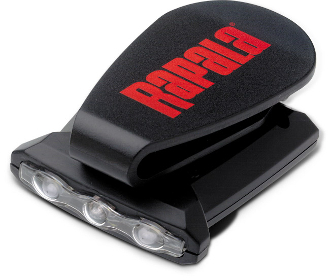 RAPALA FISHERMAN'S CAP LIGHT Designed specifically for anglers, the wide vision LEDs concentrate light where an angler needs it most, in and around the boat. Dual mode includes long-range spot focus for navigating the way. Features 3 LED's: 1 for spot focus (20 yd distance, 50 hr run time); 2 for 65 degree wide vision (10 yd distance, 25 hr run time). Pivots up and down, water resistant, 2 Lithium coin batteries included.